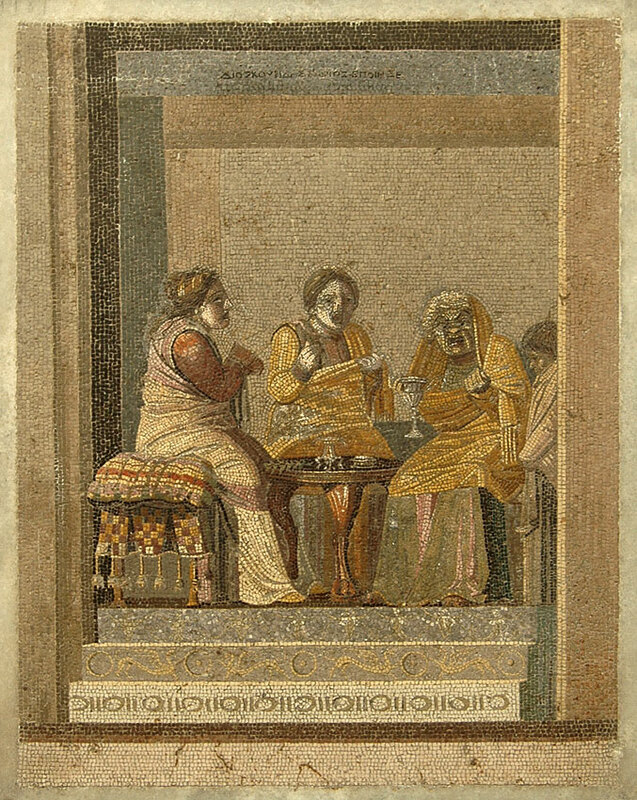 Mosaic from Pompeii (so-called Villa of Cicero). Signature above: Dioskourides of Samos. From Pompeii (so-called Villa of Cicero). This exceptional mosaic bears the signature, like another small scene from the same villa, of Dioskourides of Samos. It exemplifies the Hellenistic tradition at its best, and a recent hypothesis dates it to the third rather than the latter part of the second century B.C. The scene portrayed is either from Aristophanes’s comedy Synaristoi or from a play of the New Comedy. Three women carrying masks are seated round a circular table, two of them youthful and the other an old hag. The presence of vases on the table suggests that the sorceress might be preparing love potions, assisted by a serving girl seen on the right. The mosaic reproduces a painting characterised by pastel hues with colours that blend into one another and by a remarkable sense of volume, well embodied at the bottom by the steps and overhead by the perspective created by the wings in graded colours. © 1996 Text: Stefano De Caro, “The National Archaeological Museum of Naples”. Soprintendenza Archeologica di Napoli e Caserta. Electa, Napoli, 2001, p. 141.